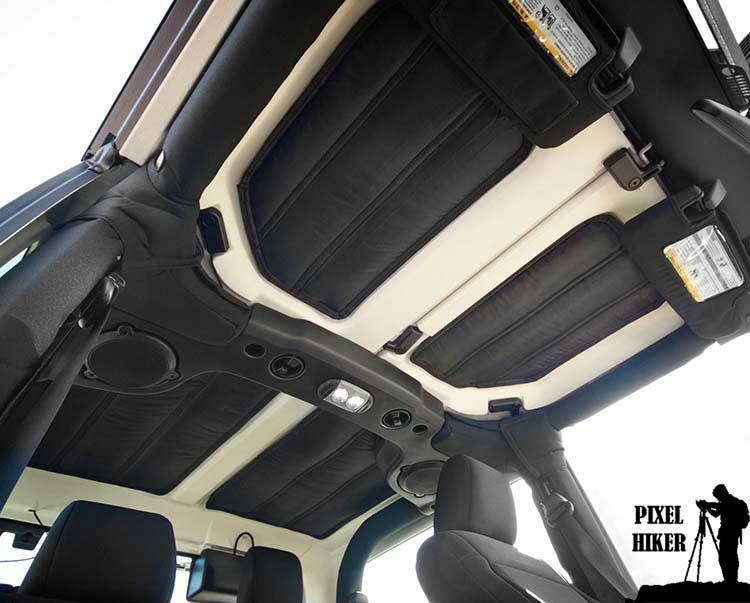 Jeep Hardtop Headliner and Why You Need One On Your Jeep! I pride myself as a excellent and thorough researcher. I always want to make sure I know all my options before making a decision. That said times there are questions to be answered that I didn’t even know to ask. To that end is the subject of today’s post “Jeep Hardtop Headliner“. My jeep wrangler came with the factory three piece hardtop which is exactly what I wanted. So what’s the problem you ask? The problem is I happened to buy my wrangler unlimited during the coldest Thanksgiving weekend Connecticut has experienced since they have been keeping track of this sort of stuff. Lucky me. I’m a 6ft tall guy who also happens to keep his hair length at 3/16” of an inch. I noticed one night that I could cold from the jeeps hardtop radiating towards the top of my head. It wasn’t uncomfortable or anything but it was there and that’s when the light bulb went off in my head. I recalled Erin’s Jeep, the Oscar Mike Edition had a headliner installed. Cars come with headliners that serve a couple functions that go beyond appearance. To start with headliners are to your car what attic insulation is to your home. A headliner acts as a layer of insulation to keep the heat out and keep the vehicle interior cool in the summer and in the winter keep the heat inside and the cold out. If you live anywhere there are extreme temperatures the need for a hardtop headliner in a jeep wrangler is real. Whether your jeep is 2 or 4 door there is a lot of exposed fiberglass to consider, a wrangler also has the areas by the rear windows to deal with. Another purpose of a headliner is to dampen noise in a vehicle. 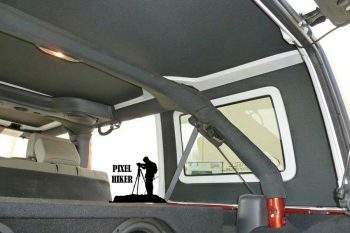 The headliner reduces the amount of noise from outside the vehicle and in a jeep there is wind and usually tire noise and any reduction there is welcome. Additionally though a headliner will tame the noise inside a vehicle. Noise bounces around hard surfaces while soft surfaces absorb sound. I jeep hardtop is a hard surface audio nightmare. A headliner should make your audio system sound better by reducing harshness created from the sound reflecting off the angled surfaces. After owning my wrangler a few days I stopped researching lift kits and switched to Jeep Headliners, they are a necessity for me. I mention at the top of this post I like to do thorough research and especially one it comes to making purchases. I have learned to “buy right” the first time and avoid wasting both time and money. I have also learned you usually get what you pay for but that doesn’t always mean the most expensive option is the best option. When I set out to research Jeep Headliners I hit the popular forums as well as google. The results on the forums were inconclusive. I think people are getting lazy and only looking at pictures and prices and not reading details. I say this because after my research was over I learned that picking the best jeep hardtop headliner was not a black and white decision. I’ll explain why that is further down. On this page I will list the results of my research. It won’t be possible to review every jeep headliner and I’m not going to pretend to. When I do make my decision I will write a separate review and put a link on this page. Note: I’m researching the headliners for four door unlimited JK wranglers and that’s the pricing that will be reflected below. Two door Jeep JK hardtop headliners are obviously less expensive. The black $233 Mopar factory Jeep Wrangler Headliner is the only one I have personal experience with, like I stated above Erin’s Oscar Mike has this installed and it arrived from the dealer that way. 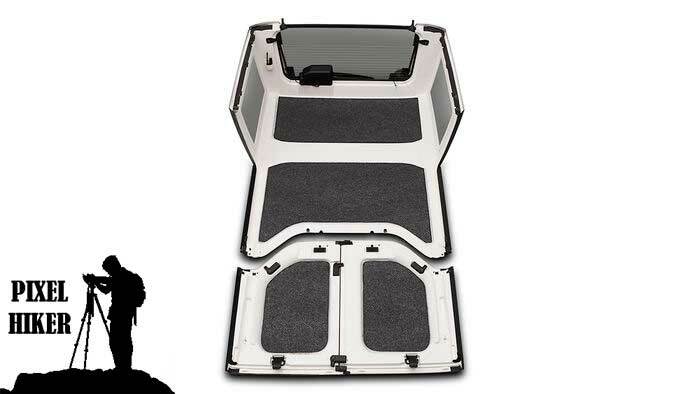 The Mopar Jeep Headliner is a complete kit that covers all the hardtop panels including the side windows. Erins fit her wrangler well and the dark grey/black color looked great with her gray interior. Chrysler/Mopar takes aftermarket jeep parts seriously. The factory Jeep headliner is a safe purchase. 4-Door – Jeep Wrangler Headliners stop heat from radiating down from your hard top, which allows your Wrangler’s air conditioner to easily keep up with any outside temperature. They also insulates against the cold by keeping warm air from radiating out. Jeep Wrangler Headliners also reduce road and wind noise and improve the sound of your stereo. They’re also easy to install! Boom Mat will run a little over $500 if you include the insulation for the back windows. Boom Mat is different in they are about reducing noise and improving jeep cabin acoustics. Insulating the hardtop is secondary. Boom Mat offers additional acoustic treatments for jeeps. The Boom Mat is a top contender for me at the time of writing this post. Riding in a Jeep is great fun except for the truck’s propensity for interior noise that makes it difficult to engage in conversations or even enjoy vehicle audio systems. Now there is an easy solution. Boom Mats new Jeep Wrangler Sound Deadening HeadLiner provides a simple pre-shaped peel and stick kit that dresses up the interior of Jeep hard tops while minimizing annoying outside noise and vibrations while insulating from exterior weather conditions. Installed Boom Mats new Sound Deadening HeadLiner has been tested to reduce noise levels from 3 to 4 decibels. This is a significant change in sound level that will improve overall interior acoustics so Jeep occupants can enjoy audio system and have conversations without excessive and irritating noise and distractions. Boom Mat Sound Deadening HeadLiner is available in black for 4-door and 2-door Jeep® Wranglers 2007 to 2010 hard tops and in black, gray and white for 4-door and 2-door Jeep® Wranglers 2011 to 2013 hard tops. The JTopsUSA Jeep Hardtop Headliner range in price from about $270 to $300 and is probably the most interesting Jeep headliner offerings I found when researching headliners for this page. The Jtops are available in in solid colors and wicked cool camouflage patterns. While the camo isn’t my thing it’s certainly a differentiator that would appeal to some. Another difference of the JTOPs is the use of hook & loop aka “Velcro” to secure the headliners. Other companies use 3M VHB for a permanent installation while the Jtops can be removed. The Jtops feature a 1/2″ antibacterial & mold resistant foam “Noise Suppressant” inner layer. No other manufacturer spells out those details. Jtops does not offer insulation for the rear windows. 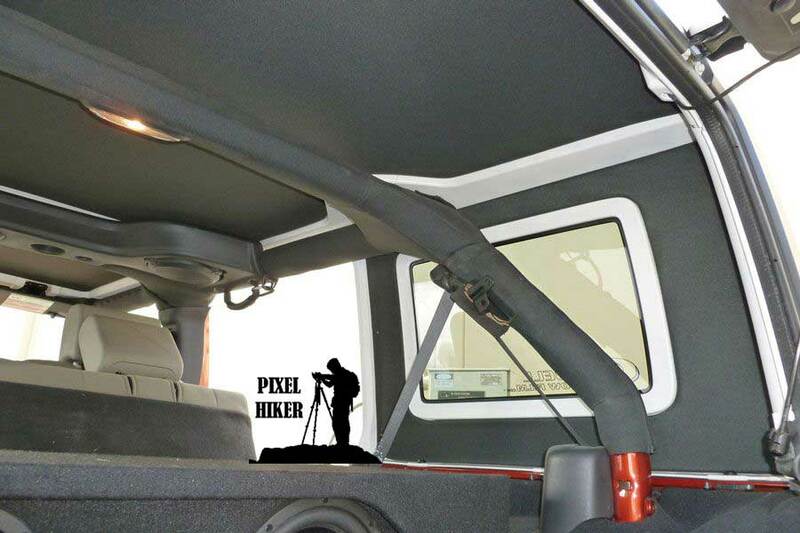 JTopsUSA introduces the evolution of the Jeep Wrangler Hardtop Headliner. Go beyond black and gray. Quad layer construction suppresses sound while blocking summer heat and winter cold. Drivers side phone storage pocket. Built with precision in the USA! Sewn in Reinforced Heat Resistant ACRYLIC Resin Hook and Loop Attachment. Please follow the instructions that come in the box on cleaning the surface of the top and the application of the Velcro. We use VHB (Very High Bond) High Heat / Extreme Cold – Acrylic backed Hook and Loop. It is extremely important to clean the surface and then apply the Velcro . We highly recommend you wait 8 – 24 hours for it to setup before putting the headliners in place. Our competitors recommend sanding the surface to install theirs but with our Wrangler headliners you do not have to go to that extreme. If installed properly they WILL NOT COME DOWN. We have installations on our personal Jeeps and hundreds of customers that have been installed for up to 3 years now with no issues! 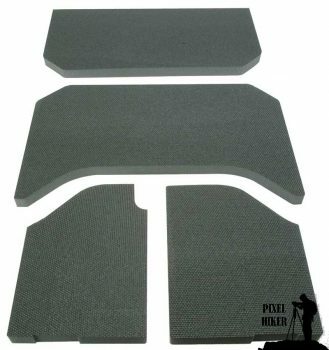 The $199 Bedrug Jeep Hardtop Headliner is a great looking kit that will mostly appeal to jeep owners who are already using Bedrug carpeting in their jeeps. 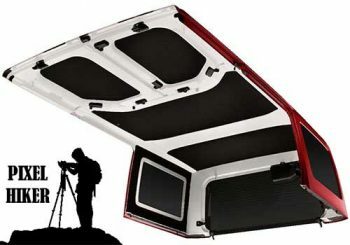 The BedRug Jeep Headliner does not include panels for the rear windows. Additionally a few sites including their own mention the panels not staying up despite proper preparation and installation. One reviewer states the 3M VHB isn’t adhering to the headliner fabric. Interesting as 3M VHB tape is incredible and is used in places to hold vehicles together. 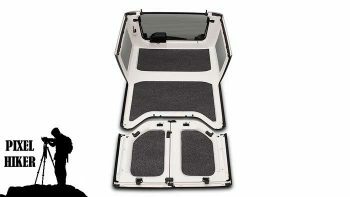 The $223 Rugged Ridge Jeep Hard Top Insulation Kit doesn’t get much press online and the Rugged Ridge website doesn’t offer up very much information so it’s difficult to judge this model. Notably this headliner insulation kit has a pleated look to it and to me it’s kind of stylish. I only see black being offered as a color choice and there’s no rear window option. If you add the rear window insulation from another company the Rugged Ridge still comes in substantial cheaper than the most expensive offerings. Have a hard top on your Jeep JK Wrangler and find the noise a little too much or is the heat beating you down in the summer? You need the Rugged Ridge Hardtop Insulation Kit. This insulation is custom fit for the factory multi-piece hard top and greatly reduces noise inside your vehicle. The special padding material is surrounded by heavy duty pleated nylon providing added interior comfort by insulating the cab from heat and cold to keep your winters warmer and your summers cooler. Durable hook and loop fasteners allows for an easy installation without removing your hard top. Special insulation material surrounded by heavy-duty pleated nylon l insulating cab from heat and cold. Sturdy hook and loop fasteners allow for easy installation. Absorbs sounds to reduce noise inside your vehicle. What Jeep Hardtop Headliner Did I Choose For My 2018 Wrangler? **Update** December 9, 2018 my girl ordered my Christmas Gift, the HotHead Jeep Wrangler Hardtop Headliner. As of December 3, 2018 I have not made a final decision but I have narrowed it down to two brands, Boom Mat and Hotheads. Both brands are similarly priced and both make acoustic properties a priority. Keep checking this page for my final decision.